ww4(dot)strongdxgsoft(dot)com Another referrer spam site: Beware ! These days referrer spams are coming up in a huge number, we are strictly against it and want it to be down, but not even Google can do anything about it, but writing has the power to anything, so here's my another post about Referrer spam. Here i am experiencing it myself, so i really really want to write about this. One of my post in past was found very helpful for users regarding Referrer spam, ww4(dot)savegco-anitvir(dot)com was a headache to everyone who saw the site in their referrer sites in stats, and innocent people clicked on the link to see where they are getting visitors from but they found nothing there and was attacked by a virus or Malware. But some people were all fine because they didn't clicked on the link. The main points of these referrer spam sites are to get a place in your stats so that you would click on their link with curiosity. These referrer spam sites don't refer any visitors in real, it's just their own computer system increasing your pageviews to get a place in your stats so that you will click it, never click these links, it might be dangerous. 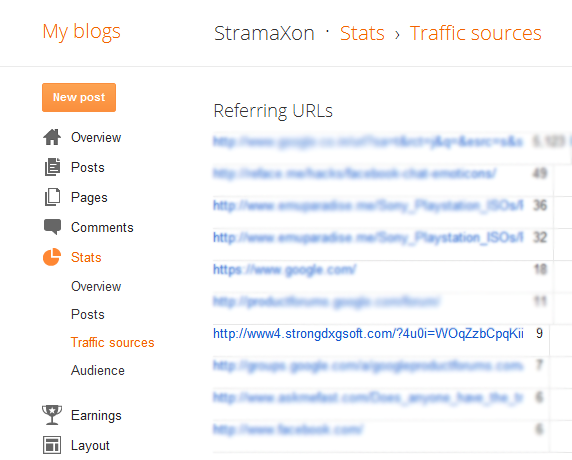 You would be thinking why i wrote another post when i already written it in past, although i was not getting any pageviews from a referrer spam sites, but today a new referrer spam site ww4(dot)strongdxgsoft(dot)com started to show in my stats ! Ok, i didn't clicked on the link but yet i am worried as it's not good to see them in stats, so now beware of ww4(dot)strongdxgsoft(dot)com. Please beware of this new site of the referrer spam site kind, no one wants to be affected by these spams, from our last post, hundreds of people were saved by these referrer spam sites. There are yet many sites that are unknown but dangerous. As we can't list all the referrer spam sites, doesn't mean that sites that's not in our list is not a referrer spam, recognizing them is easy, they have very complicated links such as '?4u0i... ' in the URL, you can check the photo, it can be recognized easily, but some don't have these. Only click on links that you know is ok to go on and you know the site is ok. But if you think you have nothing to do with the site in your stat's then just Google it, you will find resources that may help you.